Tim Gallon the owner of Black Bear Brewing is opening a new location in Bangor. The Exchange Street tap room will open Friday, April 6, 2018. 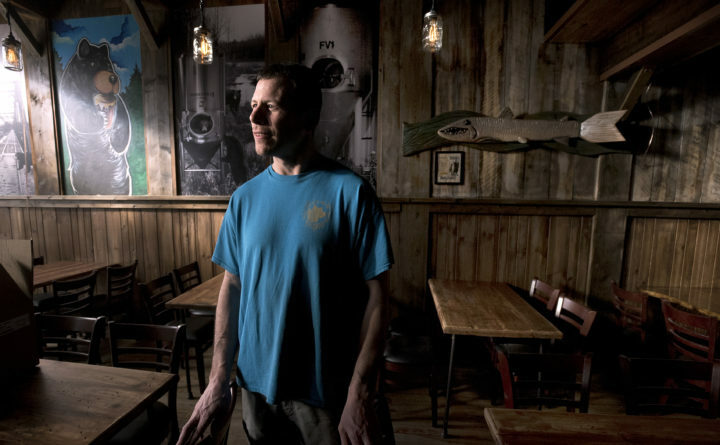 Long before there were more than 120 craft breweries generating more than $225 million in revenue in Maine, Tim Gallon of Black Bear Brewing in Orono was making beers like Gearhead Ale and Demon Stout and distributing them locally, in bottles and on tap at bars and restaurants. Gallon, who has quietly developed a reputation over the past 14 years among brewers and fans for making a wide variety of crowd-pleasing, easy-drinking beers, will this weekend open his second tap room — this one on Exchange Street in Bangor. It’ll join Black Bear’s first tasting room on Mill Street in Orono, which opened in 2012. Local developer Adam Moskovitz bought six Exchange Street buildings as one 53,000-square-foot property for an undisclosed price in October 2016. Black Bear Brewing will join other tenants on the Exchange Street block, including performance venue the Bangor Arts Exchange, the offices of the Bangor Symphony Orchestra, Bangor Ballet and Launchpad, Thompson-Hamel Financial Services and lingerie boutique City Drawers, all of which have opened in the past eight months. Though he’s lived in Orono for years, Gallon grew up in Bangor, and recalls what the downtown area was like when he was a kid. Since September 2017, Gallon and his longtime friend and woodworker, Tom Gassaway, have been remodeling the interior of the space at 187 Exchange St., which is next door to Thompson-Hamel. Rustic and reclaimed is the aesthetic, with a long, sturdy bar and custom-made tables built out of mix-and-match Maine wood. Prints by local photographer Nate Dumas and graffiti artist Isaac Wright line the walls. Wright also designs all the labels for Black Bear’s various beers. Black Bear will serve the full array of its brewing lineup, alongside cider and wine from Winterport Winery. A 5-gallon pilot brewing system will be set up in the back of the tap room for tiny batches of experimental brews. The rest of Black Bear’s brewing operations will remain in Orono. A small selection of food, including sandwiches and pretzels, will be served in Bangor. A stage in the rear of the tap room will host live music most weekends — something Gallon seems almost as excited about as he does the beer. Black Bear Brewing’s grand opening in Bangor starts at 2 p.m. on Friday, April 6. The Irish folk trio the Napper Tandies will perform at 8 p.m. that evening. Regular hours will be 3 p.m.-10 p.m. Mondays-Wednesdays, and 3 p.m.-midnight Thursdays-Saturdays.